Disclosure Agreement: Review of Mina Harissa was due to compensation from the company’s whose products were reviewed. We Dish Nutrition tested each product thoroughly and gives high marks to only the very best. Opinions expressed at We Dish Nutrition are our own. Expanding your palate can be done in many ways, whether that’s aimlessly grabbing new ingredients in the supermarket, hoping to find a hidden find of foods or meticulously assessing what flavors are already incorporated into your daily meals and where expansion would be most appropriate. Why all this talk about expansion? As someone who always reached for the Tostitos’ mild salsa, I can’t help, but regret what other flavors over the years I’ve passed up because I deemed them as too spicy. However, a couple of years ago, I finally came to my senses, being introduced to the new world of flavors, textures and pizzaz that peppers can do to elevate any dish. Harissa is a mostly commonly associated with Tunisia, Libya and Algeria, but has recently made a scene in Morocco via the Columbia Exchange. The versatility of harissa, a Maghrebian hot chili pepper paste makes it a viable candidate to join your regular meals. Variations of harissa include cumin, red peppers, garlic, coriander, lemon juice, roasted red peppers, serrano peppers, vegetable oil, olive oil, garlic paste, caraway and/or garlic paste. See how the options are endless? I recently tried the brand Mina Harissa, a red pepper sauce created by Mina herself. Since the age of sixteen when Mina was first introduced to harissa, she has been in love with the fiery red sauce’s endless possibilities. Mina worked tirelessly to add her own twist and personality to the sauce, finalizing it the recipe with red chili pepper, red bell pepper, garlic, extra virgin olive oil, vinegar and salt. While the proportions of the ingredients are not known, use of Mina Harissa’s sauces leave you grabbing the jar for seconds. 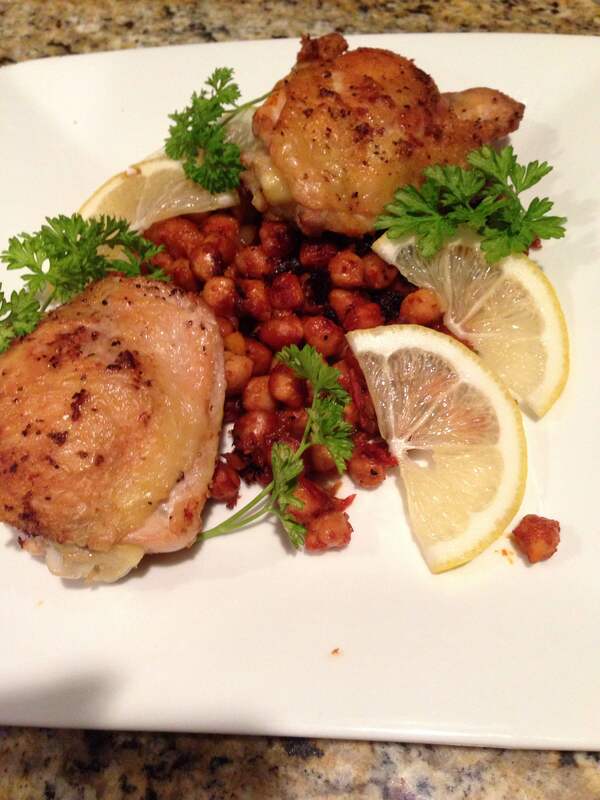 However, for today, we used the harissa recipe in Bon Appetit’s Pan-Roasted Chicken Harissa with Chickpeas’ recipe. The harissa was used inside the chicken thighs to provide flavor. The chickpeas absorbed the spiciness of the harissa, that permeated the entire chicken. This recipe was a great initial use of the harissa as it provided a well balanced meal of protein, fiber and was low in fat. The presentation of the meal highlights the different elements of flavor in the meal. I have to note that the lemon and parsley come directly from my parent’s house-yes, my parents have a few lemon trees! 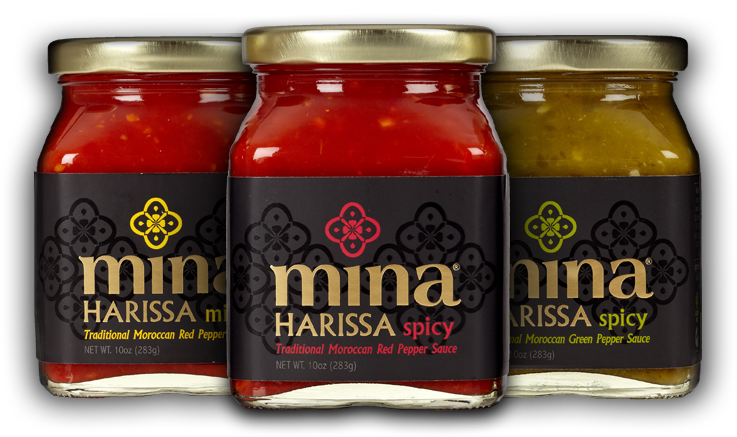 Mina Harissa has cleverly come up with three kinds of sauces, mild, spicy and spicy green pepper sauce. Blended with green chili pepper, green bell pepper, garlic, extra virgin olive oil, vinegar, cumin and salt, the green harissa adds an additional element of spice to any dish. These 10 ounce jars can be interchangeably used in the same dishes depending on the spice level wished. Keeping on hand in the kitchen, Mina Harrisa’s sauce can be used to create spreads, dips,drizzled on top of nearly any dish, or in this case, encassed in chicken with chickpeas. If I had to quantify the level of spiciness on a ten point scale, the mild would be a two or three, reflecting the softer palates The spicy Mina Harrisa is would be an eight. Use of Mina Harrisa’s products, particularly the spicy harissa is not suggested for those with gastrointestinal issues, sensitivities to chilis or peppers and/or the light hearted. Many foodies have joined the harissa bandwagon, with tons of recipes catering to these unique flavors. I can wait to finish my jars of Mina Harrisa with the recipes I’ve already gathered to try, including Harissa Spiced Sweet Potatoes, Jalepeno Boats and Spicy Green Haddock. How do you plan to add Mina Harrisa’s products to your daily menu? I know you won’t regret adding this extra punch of flavor to your dishes.